Thinking about becoming a landlord? 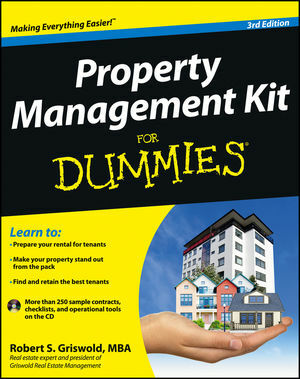 Property Management Kit For Dummies gives you proven strategies for establishing and maintaining rental properties, whether a single family or multi-resident unit. You'll find out how to prepare and promote your properties, select tenants, handle repairs, avoid costly mistakes and legal missteps—and meet your long-term goals. Now you can find out if you really have what it takes to successfully manage a rental property, and you'll learn all about the various options for hiring someone else to manage your property for you. You'll find out the right way to prepare your properties for prospective tenants, set the rent and security deposit, clean up properties between tenants, and verify rental applications. In no time at all, you can become a top-notch property manager by working efficiently with employees and contractors to keep your properties safe and secure. Complete with lists of ten reasons to become a rental property owner, ten ways to rent your vacancy, and the ten biggest mistakes a landlord can make, Property Management Kit For Dummies helps you achieve your dream of being a successful residential rental property owner. CD-ROM and other supplementary materials are not included as part of the e-book file, but are available for download after purchase. Robert S. Griswold, MBA, is a successful real estate investor and property manager with a large portfolio of residential and commercial rental properties. He is the real estate expert for NBC San Diego, the lead columnist for the nationally syndicated columns "Rental Roundtable" and "Rental Forum," and co-author of Real Estate Investing For Dummies.